“I wouldn’t say I was the best manager in the business. Old Big ‘Ead was a true one off. From verbally sparring with Mohammed Ali (holding his own with one of the all time trash talkers) to taking provincial teams to league titles and back to back European Cup wins, he was a uniquely talented, outspoken and oft controversial character, whose magnetic personality dominated the British landscape in the 1970s and1980s. Love him or loathe him you couldn’t miss Clough (here played by the excellent Luke Dickson). In many ways he was emblematic of the ‘beautiful games’ metamorphous from the black & white amateurism (wage cap and all) of the swinging sixties to the Technicolor affluence of the seventies. As TV and broadcasting coverage exploded, so did the wealth, power and influence that the players and managers held, and in “Cloughie” they found a box office superstar. A footballing Caesar, Clough was adept at the dark arts of politics, and often used his celebrity to manipulate the media, and mob at large, to his own ends. Holding chairman and even the FA’s feet over the fire by means of the press, if he felt wronged, as he was often wont to do. It is this aspect of his persona that Director Rod Dixon’s interpretation of David Pearce’s biographical novel (covering his ill-fated tenure as football manager of Leeds United in 1974 – lasting just 44 days) focuses on – the man behind all the quips and bravado. The man beset by demons. Always feeling robbed, wronged or insufficiently respected by his peers, especially Leeds United, and their manager Don Revie. And how his narcissism and paranoia effectively destroyed his (almost marital) relationship with his long-term assistant Peter Taylor (the equally superb David Chafer). With a wall made of screens as a backdrop, Nina Dunn’s (Set & Projection Designs) staging is littered with provocative props. From the hatchet to the whiskey bottle there are many hints as to the miscreant protagonists future course into self destruction, which ultimately ended in alcoholism – a lonely end for a man beloved by so many. The screen itself provides an ingenious means for the cast, of just three, to be extended. Projections of the infamous Leeds team are illuminated and given voice by off stage performers as Clough tries in vain to turn this bunch of “cheaters” into a “real team” who play football “the right way”. There is also a very clever interplay between Dickson and Clough’s nemesis, Revie, with the use of stock footage from a notorious TV interview in which the two crossed horns. Dickson and Chafer have Clough and Taylor down to a tee. Dickson mimics perfectly Clough’s unmistakable North Eastern twang and mannerisms, but controls the puffed out chest just enough so as not to allow the characterisation to slide into pantomime. His depiction also reminds us just what made the man so irrepressibly captivating – the rebellious dreamer, with the intelligent dry wit and killer one liners, every editors dream. It also reminds us how he and Taylor needed one another and why they worked so well together. Indeed, offsetting Cloughs overbearing brilliance Chafer’s Taylor (like the man himself) is the calm in the storm, helping keep Clough on something of an even keel. He expertly conveys the frustration of someone caught very much in the shade of another’s shadow. 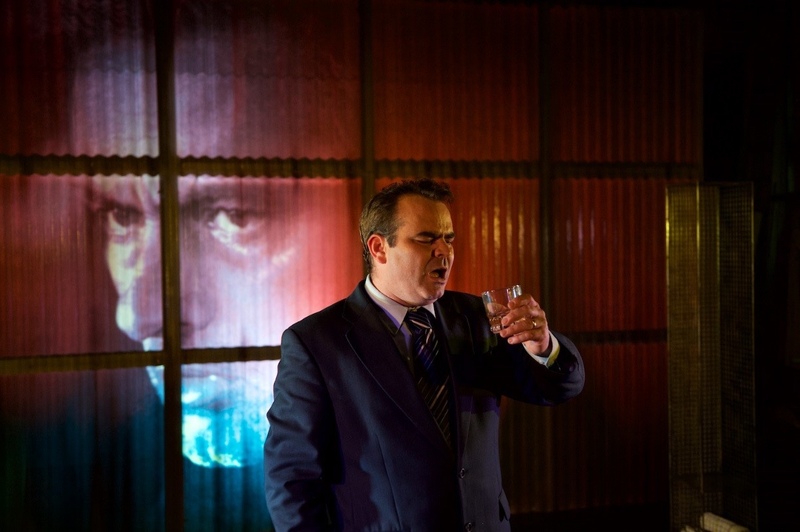 Red Ladder’s adaptation of The Damned United combines technology and convincing portrayals from the cast to great effect to explore a life plagued by doubt, and confirm that despite all this “Cloughie” is still the number one show in town. Tagged 2018, Brian Clough, bristol, Kevin Mcgough, Leeds, Leeds United, Nottingham Forest, review, The damned United, the fix, the fix magazine, theatre, tobacco factory, whats on. Bookmark the permalink.